San Francisco Residential Moving Company | Cummings Moving Co.
Ready for an easy move? As residential movers we understand that moving can be tricky; especially here in San Francisco! From peninsula homes, to apartments and condos around town, and households across the country, Cummings Moving is a trusted, full-service company. As residential movers since 1969, we serve our loyal customers One Move at a Time. Our customer-service staff, back-office office team and moving crews are employees with a vested stake in the success of your next move. Each move is different and every client has their own specific set of needs and requirements. The long-term, dedicated family here at Cummings Moving Company is here to take care of you and your belongings. “We used Cummings Moving Company for our last move. They were superb from beginning to end. We had an expert foreman and crew who were professional, trustworthy and efficient. Our property was difficult to access and the actual move a bit complicated and cumbersome and everyone worked extra hard and so well as a team to get the job done quickly. The move was a great success due to the incredibly hard work of Cummings and its expert team… Thank you so very much!” – Tracy F. Read more reviews. Our clients expect a great deal from us and every day we work to meet and exceed their expectations. As residential movers we provide service that meets you where you are. Full-Service Pack and Move – Full-Service Pack and Move of a house, condo or apartment is perfect for families and professionals who want to leave all the details to someone else. Let’s face it, time is at a premium and often, the best choice is to let a professional residential mover do the job. Cummings Moving Company will pack and move your whole house while you stay fully engaged in work, service organizations, friends and family. You Pack It – We Move It – You Pack It – We Move It is generally requested by clients ready to step-up from the days of paying their friends with pizza and beer. While not quite ready for a full-service pack and move, this client wants to pack themselves and get moved “fast and easy” so they can set up their new home and get back to life and business. Cummings Moving Company is a proud agent of Wheaton World Wide Moving. This makes it possible for us to deliver the same quality service and attention to detail, anywhere in the US or internationally. 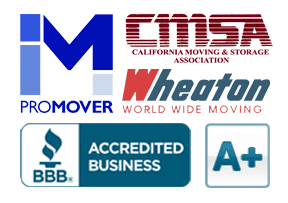 Whether you are moving to San Francisco or out of the Bay Area, to or from a different state or country, Cummings Moving Company and Wheaton World Wide are residential movers with a long history of happy clients. Do you have a pending move to or from the San Francisco Bay Area? Simply Request a Free Moving Quote. Request a free, no-obligation Moving Quote online or contact Cummings Moving Company at your convenience. Please let us know how we can help. To receive a FREE, no-obligation storage quote for a pending move simply fill in the details below. We will use this information to generate your quote and do not share this information with others.